Describes how couples can work to save a relationship that might be suffering when a religious believer is with a nonreligious person, offering negotiation tips, strategies for dealing with extended families and advice for handling holidays and rites. Original.
."..a clear and engaging guide." "--Publishers Weekly"
..".a clear and engaging guide." "--Publishers Weekly"
Marriage today looks very different from the past, when Catholics married Catholics and Evangelicals married Evangelicals. Shifting demographics, changing worldviews, and abandoned orthodoxies make who we marry an open question. And more and more, people who identify as religious are partnering with those from the growing secular ranks. Can these marriages survive the conflicts and challenges ahead? Absolutely, reports award-winning author and noted secular humanist Dale McGowan. His own long marriage to a devout believer is testament to the enduring strength of religious/nonreligious unions. But his story is only one of many. 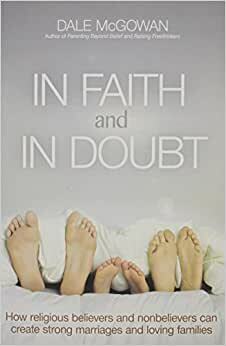 In Faith and In Doubt recounts the setbacks and successes of eight other couples as they navigate the minefields of mixed-belief marriage . . . reveals eye-opening findings from the author’s original survey . . . teases out helpful insights from the published research . . . and paints a nuanced picture of religious practices today, with guidance for crossing the belief gap—happily, for the long term. In Faith and In Doubt gives couples the information, inspiration, and confidence for forging successful unions amid dissimilar beliefs, and a rare window into the extraordinary richness their differences can bring to the relationship, their children, and those around them. I spent most of my life as a believing Mormon, and I married another believing Mormon. After painful, many years long a crisis of faith, I picked up this book hoping for strategies that would helped my now mixed-belief marriage work. I have very mixed feelings about it for couples in similar situations. McGowan is an atheist, and has had a very successful marriage to a believing Christian. To write this book, he ran a fairly large study of people in mixed belief marriages to find out what made them work and what made them fail. He shares some encouraging results- mixed belief marriages are not necessarily more likely to fail. Unfortunately for me, it was also a very painful read, and I think many Mormon/former-Mormon couples will have a similar experience. As I read the worst failure stories, I could see many of my own experiences mirrored. For example, when one partner in a fundamentalist Baptist couple became atheist, the believing spouse felt betrayed, felt that a covenant was broken, and feared the family was in danger of hell. The devastation this person experienced was way too close to home (it sounded like my wife's experience). The anger and frustration felt by the other spouse was painfully familiar, too. This couple was NOT able to work through their differences, and eventually divorced. The examples he gives of marriages that worked well felt foreign to me in most cases. They usually involve a very non-literal, non-fundamentalist believer. My spouse is a deep thinker, and nuanced in her religious views. I consider her thoughtful, but not "non-literal". I think she'd agree. She's a literal believer, so making compromises he suggests, like going to a UU church, won't work. He does make a very good point about the necessity for both partners to be non-dogmatic. His way of explaining dogmatism was really helpful, too. This was most helpful for me in examining myself. It made me analyze my own thought processes and level of open minded-ness. It's not very helpful to use his criteria to evaluate my spouse, though. McGowan has a few pieces of very good, important advice, especially regarding not wanting to convert your spouse and being respectful of his/her faith journey no matter how it turns out. A strong desire to convert the other is a major failure factor. This has been critical in my marriage. Read, this, and make sure you apply it to YOU. YOU need to be non-dogmatic. I especially loved the advice about accepting "the ultimate compliment"- meaning, your spouse believes that you as a non-believer probably won't go to hell, or as a believer are actually a decent, intelligent person. You don't have to agree on these things to be OK with each other. I think his best chapter is the one about raising kids. It's excellent, especially since I've had no other examples to look at of mixed belief marriages with kids. His advice to keep hell (or other scare tactics) out of a child's teaching is great. He has a great strategy for making sure kids know that they can search for truth, pick any set of beliefs, or change their minds as often as they need to, and still be fully loved and accepted by the family. He makes a big deal about being on the same page with your spouse and coming to an agreement on how kids should be raised. I hadn't thought through most of this as clearly as he put it. My wife even liked a lot of the ideas when I talked to her about it. The tone is very important to mention. Lots of amazon reviewers say that the believing spouses enjoyed and found the book helpful. I believe them, but I bet they are very non-literal believers. A small number of more literal reviewers found it offensive. I think a believing Mormon who is still hurting from loss and a feeling of betrayal will definitely be offended. McGowan really does try to be inclusive, but he just can't see his own bias creeping in. He spends too much time telling faith crisis stories, and doesn't give equal time to conversion stories. He never portrays believers as deep thinkers. You get the feeling that he is nice to believers, but doesn't really understand them. The worst part is that toward the end he reveals that after many years, his wife eventually de-converted, too. That felt like an ambush, and I felt mislead. It's subtle, but I could not recommend the book to my wife. Instead, I told her a lot about the useful parts, and warned her that she would likely find the book alienating. We talked about things I liked and didn't like. I think that was the best approach. Sadly, a lot of this book was pretty depressing for me. When he talked about the factors that brought success, I saw only a few of them in my marriage. When he talked about the factors that brought failure, I felt I could relate with lots of them. It was hard to get through. I had to stop and start a couple of times because it was a little overwhelming. In fact, I totally skipped the chapter about divorce. That was just too painful, since I was looking for something encouraging that would help me make things work. To be honest, I got into a pretty bad emotional state while reading parts of this book. It actually reduced my hope for a happy family. At the same time, other parts did give great, encouraging advice for having respectful family relations, honoring each person's journey, including everyone, and being non-judgmental and non-dogmatic. This stuff is, like I said, critical. Overall, I had to grit my teeth at his data and stories in order to get through it. I had to tell myself that my marriage is NOT like any of the stories, and I don't HAVE to be like those people. In truth, I'm pretty lucky, because my wife is a believer, but she really listens to me and thinks I'm a good person, despite our differing beliefs. She's got my back. I think she's perfectly intelligent, moral and a good human being. I'd defend her, too. It was hard to get here, though, and sometimes things are still very hard. I think if I had read this book earlier in my faith crisis it might have made divorce sound more appealing. It could possibly have made me feel like there was no to make things good. So, there you have it! It might be useful for some of you, especially if you have already settled into a stable, fairly happy situation and just want strategies for raising kids or other specific issues. If your marriage is currently in crisis because of faith differences, I would not recommend it. To be honest, I think this book would be more useful to someone who is CONSIDERING a mixed faith marriage, rather than someone who unexpectedly ended up in one. This book is not just for couples. I participated in the survey and was so happy to be asked detailed questions about what I actually believe and how important those beliefs are instead of simple god/no god questions. Those simpler questions can't grasp the complex spiritual landscape in America today. McGowan shows how few people match their beliefs to what their church says. Yet, people do identify with their religion, an important point that is often missed. A key point covered is how dogmatism can kill relationships, regardless of that being religious or non-religious dogmatism. This really should be obvious, but gets lost in discussions about religion. The book includes great advice for anyone attempting to reach across the belief divide and is hopeful about a future where children choose their spiritual path and everyone recognizes the value of others. McGowan is one of the most mature atheists I've read. He has truly moved past the no-God angst that plagues most of us. This book calmed me down, caused me to redouble my efforts to be kind to my wife, and gave me new hope for our relationship. I'm currently dating an atheist, and I identify with Southern Baptist/Non-denominational Christianity. The past couple of years has been really hard for me as I reevaluate what I believe and why I believe it and how it fits into my relationship with a non-believer. There isn't a lot of literature on relationships of mixed beliefs/religions that I've found that isn't biased. While this is, it's in support of mixed relationships, while still pointing out the problems logically. This book was well written (not stuffy or presumptuous) and provided feedback on how to solve certain problems that arise, and that I've been experiencing, like disrespect, traditions, thoughts about future children, how to handle families, etc. I also really liked reading the couples' stories because they were relatable. Overall, I'm really glad I bought this book and I plan to discuss it with my boyfriend after he reads it.